From the impact of disruptive technologies to the imperative of digital transformation, businesses today must find new ways to innovate or risk being left behind. While data flowing rapidly between the Internet of Things and multi-cloud computing environments brings tremendous opportunity, there’s also a great deal of complexity. Artificial intelligence (AI) and machine learning (ML) are part of the new wave of solutions capturing the minds of enterprise leaders to respond to these new opportunities and complexities. Digitally literate leaders who are highly cognizant of this wave, are jumping in headfirst and applying AI and ML to solve real business challenges—making enterprise goals of enabling cost savings via smarter operations and decision making come to fruition. employs a differentiated approach with a more holistic point of view for the enterprise. 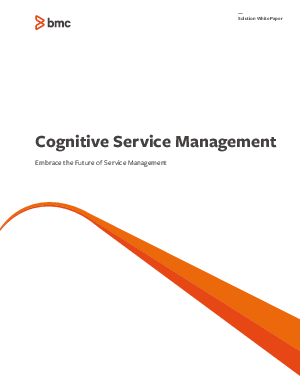 Cognitive Service Management, the most cutting-edge stage of IT service management (ITSM) evolution, represents a powerful way to drive change in your organization without “ripping and replacing” your current infrastructure. By combining the latest in artificial intelligence and machine learning with your existing investments, Cognitive Service Management provides an actionable path to greater value, powered by the technology of the future.